A small brouhaha started a few days ago when a Target customer snapped a picture of a Target store employee bagging at a check stand. It turned out the bagger had been a fairly prominent actor on a top 1980’s sitcom, so this customer posted it on social media with comments shaming the actor. Actually, shame on the customer and the media outlets that ran the story. Many of Hollywood’s top actors defended the Target employee, as they should. Acting is a very infrequent job, as many pointed out, and there’s no shame in taking any type of work to help pay the bills. Many also shared their own stories of working for hourly pay while they were struggling to make it as an actor. I am 100% behind the integrity of this actor. Most of us have a crazy background of jobs held long before we climbed the so-called “success ladder,” me included. I believe there’s more to the story of having these types of unrelated experiences, far more. 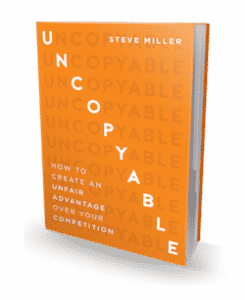 I share what the is in this week’s UNCOPYABLE Business episode #108. Hollywood is as fickle as the music industry. Flavor of the month, there is a lot of people in the same company. (Kip) Wingger was a top band in the late 80s – early 90s I hear works at a reasturant (as one of their song title is) Easy Come Easy Go. A (retired) vocalist, hung up on the founder of the band Journey thought he was being pranked. He ended up fronting the band for a few years. We have two choices, we can let life pass us by, or take risks (even fail), and find out what we are made of. Love the post, Steve. Thank you for sharing this. A friend of mine was having home remodeling construction. One of the laborers was a former Super Bowl running back that had a long most successful career. He was laying bricks. His employer was also offering him reading lessons as he was unable to read above an elementary school level although he graduated from a major college as a star running back. My friend graciously treated him the same as all laborers, appreciating his hard work. After over 50 years of work I am personally unemployed after having lost a business and now again restarting and looking for an opportunity. Thinking out of the box is paramount, becoming uncopyable again is urgently required. Thanks for the inspiration. Thank you, Russ! I appreciate your comments. Good luck with your search!